“Why do you think I got it for you?” replied His Hawtness. I’d been half-heartedly thinking of a DELICIOUS trailer for a while, just so that darling book wouldn’t feel less loved than PRIVATE ARRANGEMENTS. (And it’s not, if anything I love it more.) But I was all publicity’ed out, there’s no evidence that book trailers sell books, and I couldn’t think of a scene in DELICIOUS that would easily turned into a script. 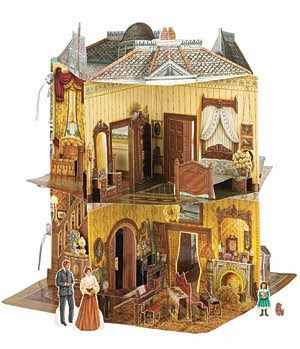 But the dollhouse got me started. In the end, I didn’t photograph the dollhouse. The little paper dolls that came with the dollhouse were either unsuitable or damaged. My own paperdolls were too big in proportion. Bettie Sharpe and her husband gave many helpful suggestions on how I could accomplish it as a simple bit of computer-generated graphics by merging a shrunk-down paperdoll into a digital background in Photoshop. But I was not quite in the mood for doing battle with Photoshop–and it would have been a battle, given my general ineptitude around both graphics and sophisticated software. But I did make a trailer, a simple, barebones teaser. And His Hawtness still gets credit for inspiring me, because without his lovely present, it would never have happened. Thank you, sweetie. Would You Buy a Book from This Woman? See you in 11 days! Such a sweet and wonderful man you have. The trailer looks awesome. Apparently I AM one step ahead of you. LOL. I do love the dollhouse and more important, I love the term ‘His Hawtness’. 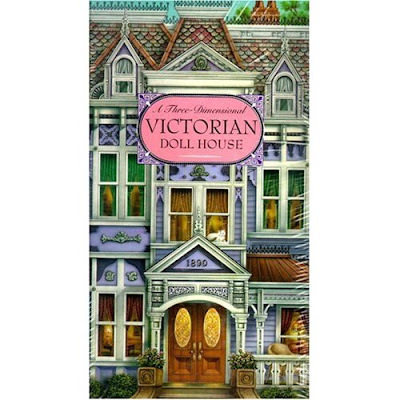 The doll house is lovely! What a nice this for “His Hawtness” to do. And for 2 bucks no less!